It was with great interest that I learned about Australian soap actor-turned director Baz Luhrmann's latest - it’s called Australia, and the early reports indicated it might be good. (Unfortunately, it wasn’t, not really – James). That’s a relief, because since Strictly Ballroom (1992), his movies have been – how can I put this – nauseating, over-produced crap. For a kick-off, the whole thing’s about showing off. Ooh – look what I can do with this camera! Isn’t it cool? Frankly, no. It’s bloody annoying – stop jiggling the damn thing around and concentrate on actually shooting something worth seeing. ‘A pair of star-cross’d lovers take their life’? Not bloody quick enough to stop me feeling like I’ve been on the business end of a vibro-massage chair on the highest setting for what is actually around two hours but seems like six. If you’ve ever heard Luhrmann’s truly awful single Everybody’s Free (To Wear Sunscreen), you’ll know just how desperate he is to be cool. The fact is, it wasn’t even his voice on the recording, which says a lot. And what’s with the title of the film? Romeo plus Juliet? If we’re talking equations, the formula would be (romeo+juliet)-directing talent=overblown trash. It’s Romeo and Juliet, Baz. Another reason to dislike it, even before I opened the DVD box. Before you ask, yes – I did sit through the whole 120 minutes of it. I’ve also read the play and seen it performed on stage. I never saw someone make quite such a hash of it, though. I’ll agree with James that Pete Postlethwaite put in a good performance, but the rest of the cast seemed very under par – even the usually dependable Leonardo Di Caprio. Di Caprio’s career started a bit hit-and-miss, but with films like The Basketball Diaries (1995), The Aviator (2004) and The Departed (2006) he’s more than proved his mettle, and the fact he did this after The Basketball Diaries makes me wonder if he wasn’t a bit short of cash at the time. As I have admitted, I don’t get Shakey – but I’m prepared to try. I have actually enjoyed parts of it, but as a whole, I find the language and the cultural references a bit beyond me, and sometimes quite overwhelming. 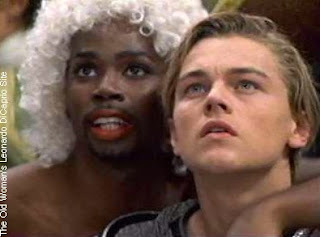 Watching R+J (hey, that’s even cooler!) made the whole thing worse by dragging it kicking and screaming into the 1990s. Not only was any potential cultural reference swamped in unnecessarily garish visuals, ‘modern’ settings and irritating camera work, but the dialogue was often shouted so loud it became incomprehensible. If this had been my introduction to Shakespeare (as it seems to have been for many of today’s under-30s) I doubt very much if I would have invested any more time in his work. In short, it is a music video with words by DJ Will S., the only saving grace being the soundtrack – and that’s only if you like early-ish Radiohead. Distorted, dissonant and disproportionate. I now sit back in my comfy chair and await all those people out there with an axe to grind to pop in and tell me how wrong I am – bring it on. James, you always said I should someday write about a film I didn’t enjoy – so here it is. A review of something irredeemably crap. Happy now?